Top: Ebony. Back : Ebony. Sides: Ebony. Fingerboard: Ebony. Bridge: Ebony. The Ebony line has a deep brown body with reddish-brown striping, finished in satin for a natural look. The light colored Maple rosette and binding creates a nice contrast to the Ebony body. TOP: Striped Ebony. The Ebony line has a deep brown body with reddish-brown striping, finished in satin for a natural look. The light colored Maple rosette and binding creates a nice contrast to the Ebony body. SIZE: Tenor. STRINGS: Aquila Super Nylgut®. The Ebony line has a deep brown body with reddish-brown striping, finished in satin for a natural look. The light colored Maple rosette and binding creates a nice contrast to the Ebony body. STRINGS: Kala Round Wound. New for 2018 is the Striped Ebony U•BASS®. The beautiful Striped Ebony U•BASS® has a deep brown color with reddish-brown striping. The Maple binding creates a striking contrast with the Ebony body, helping the striping stand out. This uke features striped Ebony top and body with a lighter Maple rosette and binding that creates a nice contrast to the Ebony body. The Mah neck has a 17" scale and is paired with a Walnut fretboard with 18 frets, a 1.39" nut width and dot inlays. New for 2018 is the Striped Ebony U•BASS®. The beautiful Striped Ebony U•BASS® has a deep brown color with reddish-brown striping. The Maple binding creates a striking contrast with the Ebony body, helping the striping stand out. 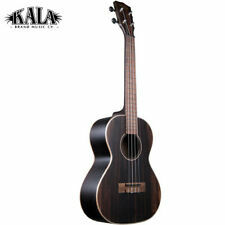 Kala KA-EBY-C Ebony Concert Ukulele. These Ebony ukulele shows of a reddish-brown striping against a deep brown body, all brought together with a contrasting maple trim for the binding and rosette. We finished this wood in satin to give it the natural glow it deserves. 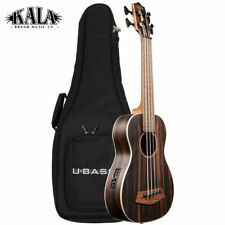 The Kala Ebony Soprano ukulele shows of a reddish-brown striping against a deep brown body, all brought together with a contrasting maple trim for the binding and rosette. Kala finished this wood in satin to give it the natural glow it deserves. This Ebony Soprano ukulele shows of a reddish-brown striping against a deep brown body, all brought together with a contrasting Maple trim for the binding and rosette. This wood is finished in satin to give it the natural glow it deserves. Amahi Classic Concert Ukulele with Ebony Top, Back, and Sides, and UK-500T Electronics - Satin Natural Finish, Model #UK-990C-EQ. 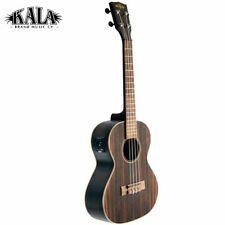 The Amahi UK-990 Ebony wood concert ukulele has an exceptionally clear and intonated tone. SIZE: Soprano. The Ebony line has a deep brown body with reddish-brown striping, finished in satin for a natural look. The light colored Maple rosette and binding creates a nice contrast to the Ebony body. STRINGS: Aquila Super Nylgut®. SIZE: Soprano. The Ebony line has a deep brown body with reddish-brown striping, finished in satin for a natural look. The light colored Maple rosette and binding creates a nice contrast to the Ebony body. 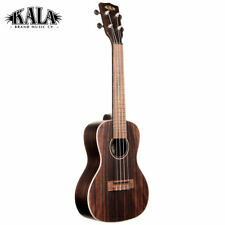 Kala Ebony Acoustic-Electric U-Bass, Fretted with Gig Bag. New for 2018 is the Striped Ebony U•Bass. The beautiful Striped Ebony U•Bass has a deep brown color with reddish-brown striping. The Maple binding creates a striking contrast with the Ebony body, helping the striping stand out.